TNPSC DEO Hall Ticket 2019: The Tamil Nadu Public Service Commission (TNPSC) higher authority is going to conduct the TNPSC District Educational Officer Preliminary Examination On 2nd March 2019. For this purpose, the officials will release the TN District Educational Officer Admit Card 2019 a few days before of the examination date at www.tnpsc.gov.in. Candidates who are willing to participate in the TNPSC DEO written examination, they should download the Tamil Nadu DEO Call Letter 2019 from the official site. It is impossible to write the examination without TNPSC District Educational Officer Hall Ticket 2019. So all the applicants keep it remember and attend for the examination. Further information related to the Tamil Nadu PSC DEO Admit Card 2019 mentioned in the later sections. The TNPSC DEO Hall Ticket 2019 is a mandatory document for the written examination. The management of the examination will not allow the candidates into the examination hall without having the Tamil Nadu DEO Call Letter 2019. The Tamil Nadu Public Service Commission officials will declare the TNPSC District Educational Officer Admit Card 2019 at the official website one week before of the examination. To download the TNPSC DEO Hall Ticket 2019, candidates need to enter the Registration ID, Date of Birth details. Candidates need to store all those details carefully. Without those details, it is not possible to download the TNPSC DEO Hall Ticket 2019. Candidates need to enter the below-mentioned information to download the TNPSC DEO Hall Ticket 2019. 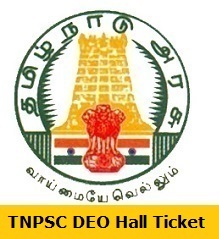 The TNPSC DEO Hall Ticket 2019 contains the following information. Candidates required to carry any one of the original ID Proof for the examination along with TNPSC District Educational Officer Admit Card for security purpose. The Tamil Nadu Public Service Commission (TNPSC) authority is planning to conduct the preliminary examination on 2nd March 2019. After completion of the prelims examination, the authority will announce the Mains examination date. There is a limited time for the written examination. So all the applicants must focus on your preparation to get the best marks in the written examination. For more upcoming updates keep following Sarkari Recruitment on a daily basis. First of all, candidates log in to the official website of TNPSC at tnpsc.gov.in. Tamil Nadu Public Service Commission (TNPSC) homepage will open. In that main page, online services option will be available and click on it. Hall Ticket Download option will be shown again hit on it. Now a page will open about all exams hall ticket related. Find the TNPSC DEO Hall Ticket 2019 link and click on it. As per given info, TNPSC DEO Admit Card will be open. Check all printed data and download it.